Microsoft today announced that the next generation of online multiplayer gaming service Xbox Live will be available in North America on the Xbox 360 video game and entertainment system starting this holiday. In addition to the free Xbox Live Silver membership available to every Xbox 360 owner, for only $49.99 (U.S.) gamers can amplify their gaming experience with a 12-month Xbox Live Gold membership. Gamers looking for a truly engaging and immersive online multiplayer experience can pick up one of the Xbox Live Premium Gold Packs, which include the new Xbox 360 Headset, Xbox Live Arcade games, Microsoft Points for use in Xbox Live Marketplace, and mail-in rebates for up to $20 (U.S.) off any Xbox 360 game. According to film industry pub Variety, Fox and Universal have finalized the deal with Microsoft for the upcoming movie based on Bungie's hit videogame Halo. The movie studios will pay Microsoft $5 million against 10% of the gross. The script, approved by Microsoft and Bungie, was written by Alex Garland, who wrote 28 Days Later; former Columbia president Peter Schlessel is set to produce. With the recent arrival of our new XCM viper regular case we have simply been swamped with masses of orders. 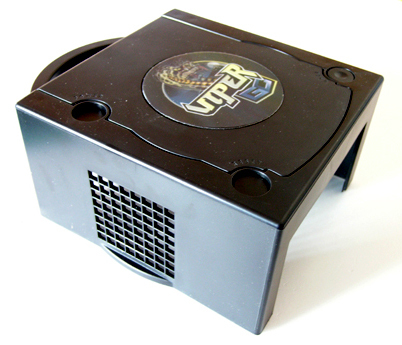 Maybe it's the official Viper GC hologram jewel that has made this case a great success, the high quality, or perhaps the value analysis technique that went into this project - making this case the best solution for all Gamecube modders out there. We would like to take this opportunity to thank all our distributors, retailers and customers alike for their great support on our fine range of cases. Stay tuned for an exciting announcement shortly! Its quite possible that Sony's upcoming Next Gen console PS3 will ship with a deffective processor chip. The chip has 8 synergistic processor elements for Multicore processing, however only 7 of them are ever used by the processor. Meaning if one of them is defective, Sony will still ship the chip as a full functioning processor. If the system has 6 or less working SPE's- sony will NOT ship the system. Sony Computer Entertainment has not yet reached a decision on when the PlayStation 3 next-generation console will launch in Europe, with SCEE president David Reeves commenting that "you could be in for a surprise." Reeves was speaking at the first day of the ELSPA International Games Summit in London, where he focused largely on issues affecting the current generation PS2 and the forthcoming PSP handheld - but took the time to answer a question about the schedule for PS3.